As your Ning Network grows larger, you may find that you could use some help with managing it. Promoting members of your Ning Network to administrators will give them the same privileges that you as the Network Creator have. To promote a member to administrator status, click on the green administrative toolbar that appears in the top left corner of your network. Select the third icon to get to the Member Management panel. From here, click on “Members.” Check the box next to the person you’d like to make an administrator on your network, and then click on the “Select An Action” drop-down menu to expand the list of options. Make sure to select “Administrator” under the “Set Administrative Role” section of the drop-down menu. This will automatically update your member’s status on the network. Please note that the Active Members list displays the member categories that members belong to, as opposed to the roles they have been assigned to. 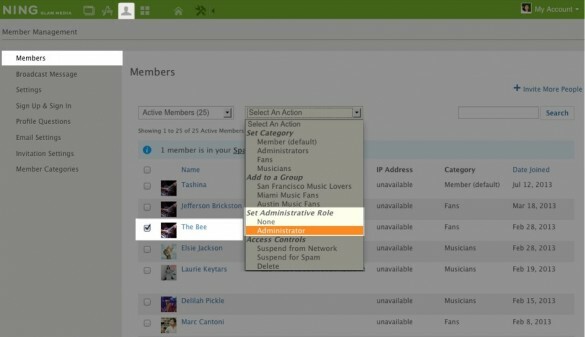 To view administrators on your network, select “Administrators” from the first drop-down menu. From this page, the fourth column will note the administrative role of the member. Administrators will have the same privileges as the Network Creator. This means your Administrators can edit member content, access the File Manager and Domain Mapping pages, as well as have the ability to change settings and delete pages. Please note that an administrator can also promote or demote other members on the network, so take care when selecting administrators.